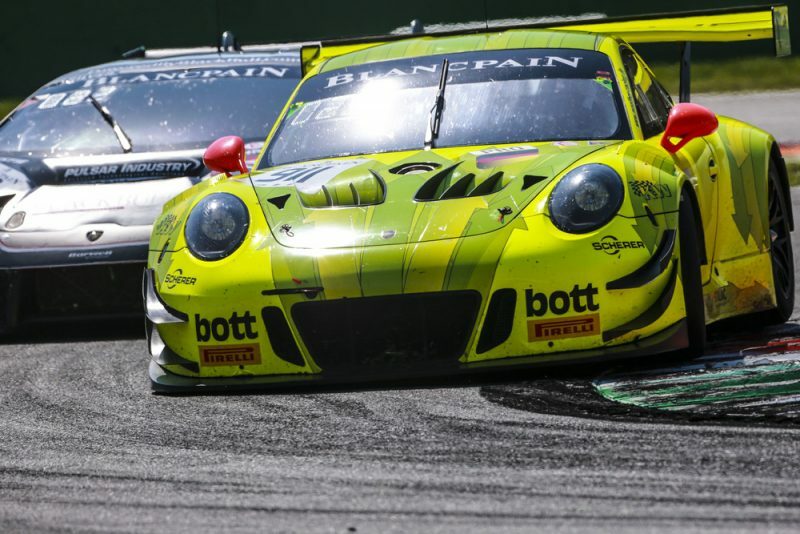 The Porsche 911 GT3 R fielded by the Manthey-Racing team finished round one of the Blancpain GT Series Endurance Cup at Monza without earning points. A technical defect in the early stages of the three-hour race made it impossible for the three Porsche works drivers Romain Dumas (France), Frédéric Makowiecki (France) and Dirk Werner (Germany) to compete amongst the frontrunners. The German-French trio contested the category solely for professional driver pairings. In sunshine and warm summer temperatures, the 54-strong field from twelve different manufacturers took off on the 5.793 kilometre Formula 1 racetrack on the outskirts of Milan. In addition to Manthey-Racing, a second Porsche customer team, Herberth Motorsport from Germany, will contest all five races of this year’s Blancpain GT Series Endurance Cup. The all-German line-up of Jürgen Häring, Edward-Lewis Brauner and Wolfang Triller secured fourth place in the amateur category for gentlemen drivers in the ca. 500 hp Porsche 911 GT3 R.